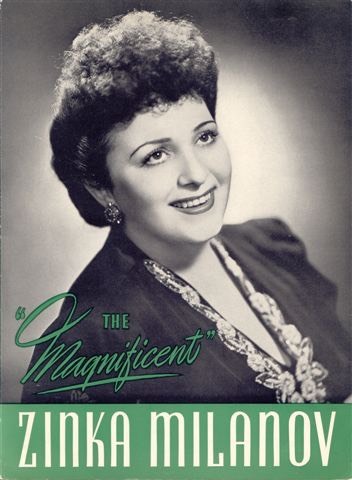 FDR told Zinka that the aria she sang at the White House Correspondents dinner was not only too short, but so beautiful he wished she had sung it twice. Fiorello H. LaGuardia, after her first Metropolitan Opera Aida, rushed backstage to proffer his ardent declaration of admiration for her “utterly magnificent singing” and a promise that he would be back as often as he could when she appeared—a promise he faithfully kept. Francis Robinson (referring to the early years of the Bing administration): "Zinka Milanov kept the doors of the Metropolitan Opera open!" Mario Del Monaco addressed her respectfully on many occasions as “Maestra di canta,” especially as they came offstage together after singing the tomb scene of Aida. During rehearsals for that scene and for the final scene of Ernani, to name but two examples, he was observed frequently requesting her assistance in learning how to sing certain passages softly. Tito Gobbi pronounced her “The great and beautiful Zinka Milanov” after making his Met debut as Scarpia opposite her Tosca, and then took to sending large baskets of flowers to her dressing room for her future performances, though they never again sang together. Alberta Masiello, after working with her on the last-act Otello arias, told Rudolf Bing that no matter how old Zinka got, he should keep engaging her every year to sing them on gala performances so that all the younger sopranos could learn from her and the public could continue to have the music performed so responsibly.